Chrissy Gilbert, associate director for Transfer Admissions; Kim Kleinman, director for Undergraduate Advising; and Michelle Loyet, manager for Online Learning Administration and Student Services, will present on “Online Students: How Webster University Serves a Growing Population” at the 2017 Conference on Transfer and Articulation sponsored by the Missouri Department of Higher Education in Jefferson City on Friday, Feb. 24. Their presentation will trace the life of a student from inquiry to admissions through the advising process and into classes with the full complement of services the University offers them to underscore that “online students are our students,” as Michelle Loyet puts it. A feature of the talk is data she has assembled that shows students mix and match online and on-ground courses on the basis of availability and convenience. Webster University’s experience in online education since 1999 will be offered as a resource for other institutions in the State of Missouri. Laura Rein, dean of University Libraries, has been named a Fulbright Specialist for a tenure of three years. As participants in the Fulbright international exchange program sponsored by the U.S. government, Fulbright Specialists are eligible to be matched with projects designed by host institutions in over 150 countries to increase mutual understanding between the people of the United State and the people of other countries. Webster faculty member Tim G. Andrews, who teaches Walker School of Business & Technology programs at Webster Thailand, has been appointed senior visiting research fellow at the London School of Economics and Political Science (LSE) for Summer 2017. 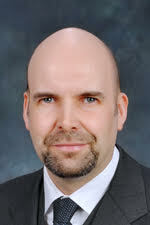 Read more about the appointment in this Webster University Thailand announcement. Katie Ervin, Webster regional director for the Midwest, participated in the Kansas City 2017 Executive Leadership Summit by presenting a panel on mentoring the new generation on Feb. 17, 2017. Also on the panel was alumnus Col. Chip Bircher who graduated from Webster in 2003 at the Ft. Leavenworth campus location when he attended the U.S. Army Command and General Staff College. 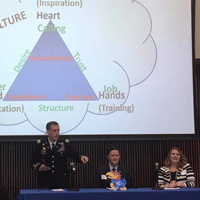 The executive summit brought together leaders in military, business, and academe to address key leadership challenges facing our world today. The theme this year was developing the leaders of tomorrow. Ervin provided a short introduction of mentoring in academe and in the workplace followed by open questions from the audience.